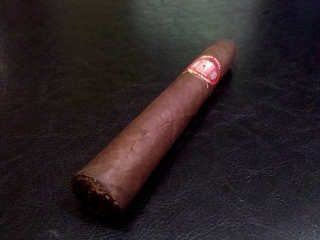 Since I didn’t get to smoke over the weekend I decided to pick a cigar I am pretty familiar with to review. 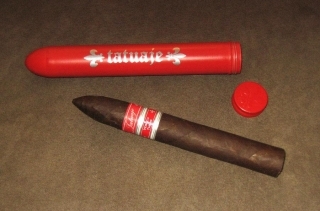 The Tatuaje Verocu Tubos is probably one of my favorites from the Tatuaje brand. So it was a Tuesday and with nothing really going on so Ben and I decided to stop at SoHo Cigars to find something new to smoke while doing the review at the shop. After chatting with Scott he recommended I try the El Tiante Corojo but for some reason I thought I needed something a little stronger after a long day at the office and grabbed the Maduro. So before I even get into the review let me just say you can add me to the 50% who are not fans of the Maduro. 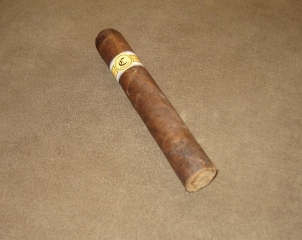 I found out a little later that El Tiante is working to update the Maduro blend due to a 50/50 love/hate of the blend. To be fair Scott hooked me up with a Corojo which he said was much better and I will be trying it out in the next week or so (Thanks Scott!). The entire El Tiante brand was pretty interesting. At SoHo Cigars they are presented a nice glass case in the center of the walk in humidor. They have fairly nice packaging and their boxes are pretty similar to Graycliffs. Every time I’ve been in SoHo Cigars I always seemed to check them out but I was always a little unsure if they were worth a try. The one thing that did stand out to me was that the Natural, Corojo and Madura all have red hues which is kind of odd to me for a cigar. One of my favorites and one that I am pretty familiar with. Only problem is this Tatuaje Cabaiguan has some crazy imperfections!